…Because life is much more colourful than you can imagine. The 25 women whom author Rashmi Bansal features in her fifth book have realised this and more.In her blog, author Rashmi Bansal explains the reason for the title Follow Every Rainbow. The title is inspired from a line of her favourite song, “…follow every rainbow till you find your dream” from the movie The Sound of Music. “I chose this title because I think it describes the way women look at their lives and careers. We don’t want to climb every mountain just because it’s there. We need to see that rainbow over the horizon,” she writes of her choice of title.It’s her fifth book and Rashmi is back with 25 stories on 25 women entrepreneurs across the country and the world. Like in her earlier books, Stay Hungry, Stay Foolish and Connect the Dots, here too the theme is entrepreneurship. The author has divided the stories in this book into three segments —Lakshmis, Durgas and Saraswatis.Lakshmis are the women you do not typically expect to start businesses. They are not very educated and many of them are housewives. But once the business became a success, the other family members chipped in to carry on the good work, ‘because success is not something one seeks for the self, it is sweeter when shared by all’. Here, she gives us the success stories of Meena Bindra, the owner of`300-crore salwar kameez selling brand Biba; of the grit and determination of Premlata Agarwal, the oldest woman to scale Mt Everest; of the intelligence and business acumen of ‘Loan Ranger’ Manju Bhatia, who, at 26, is the joint managing director of Vasuli, a pan-India loan recovery company which employs only women and more. Durgas are women who have faced personal tragedies in life, perhaps deaths or divorce, because of which they had to stand up on their own feet. Once they took up the challenge, they were up for it. Here you have sculptor Jasu Shilpi, who narrates why she choose such a profession— because Michaelangelo had said ‘sculpting is not a woman’s work’. The story of Ela Bhatt who runs SEWA is another awe-inspiring one.The third category of women are the Saraswatis — the modern, educated women armed with professional degrees. At some point, they decided to drop out of the general rat race and start their own enterprise.What these stories depict is that a woman need not need be a perfect mother or a perfect businesswoman, she just has to achieve the balance and each woman handles it in a different way. The book is a compilation of such interviews and though not a bestseller, it does make for some inspiring and interesting reading. 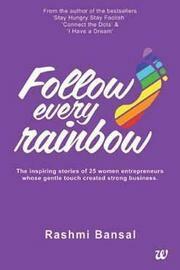 The book’s blurb reads: Follow Every Rainbow is the story of 25 enterprising women who took up a challenge. They raised a family as well as a company, with love, laughter and patience. Managing multiple equations – never giving in or giving up. These stories say one thing loud and clear. Women think and act differently, but they can be just as successful. What `success’ means, is something only you can decide.Rashmi Bansal is the author of four non-fiction books – I Have A Dream, Stay Hungry Stay Foolish, Connect The Dots and Poor Little Rich Slum. The first three deal with entrepreneurs while the fourth is a description of Dharavi, Asia’s largest slum.However, in Follow Every Rainbow, Rashmi has specifically compiled a list of 25 women entrepreneurs. This interested me because (a) I am a woman myself and (b) There are not many books available on women entrepreneurs, especially in India.What amazed me was that Rashmi has dedicated the book to her mother-in-law Santosh Bansal. In a country where Ekta Kapoor’s regressive serials rule the roost, this came across as a refreshing change. However, as I read through the book, my amazement diminished. Many of the women entrepreneurs openly credited both their mothers and mothers-in-law for providing them the kind of support which enabled them to set-up and run their businesses.The title of the book has been taken from The Sound of Music (Climb every mountain, Ford every stream, Follow every rainbow, Till you find your dream). As she mentions in her note, although women are as capable as men, the circumstances must allow. However, women shall show new ways of thinking and doing things.The book has been divided into three sections – Lakshmi, Durga and Saraswati. The eight women featured under Lakshmi are the `ghar ki lakshmis` who brought wealth and prosperity to the home – by co-opting family members into their business. Circumstances forced the eight women featured under Durga to be enterprising, to fight for survival; they rose to the challenge, slaying demons within and without. The nine women featured under Saraswati are armed with a professional education and they are carving out an identity through entrepreneurship.A common theme running across all the women’s experiences is the immense support they have received from their family members – parents, in-laws, husband, children, etc. Rashmi makes no bones about the fact that starting and running a business is tough for a woman and she will need all the help she can get from her family. Another point beautifully brought out reading through the book is that children are proud of the fact that they have a working mother – someone who is doing something on her own. Most times, women feel guilty that they are not doing enough as a mother. However, Rashmi’s narrative says that need not be the case. As long as you have a support system in the form of maids and cooks, in addition to your family members, you can manage a business. Her advice to women entrepreneurs is that we underestimate ourselves a lot. We have to be proud of what we are and whatever we do, we should do it fully; we owe it to ourselves.What shines across in the book is the fact that all the women wanted to give back something to society. They were passionate about what they were doing and did not bother about making profits in the beginning itself. They were more focused on doing a good job and satisfying their customers.The women featured in the book are from diverse fields such as cooking food (Rajni Bector, Patricia Narayan), tribal arts (Leela Bordia, Neeti Tah), information technology (Sangeeta Patni), sculptor (Jasu Shilpi), etc. The eldest woman featured in the book is Ela Bhatt (79 years) – the founder of SEWA (Self-Employed Women’s Association) and the youngest is Manju Bhatia (26 years) – Joint Managing Director of Vasuli, a loan recovery company which employs only female agents.I personally enjoyed reading about Meena Bindra (Biba) because my mother and I are huge fans of Biba and buy quite a lot of their stuff; Nirmala Kandalgaonkar (Vivam Agrotech) because she is in the unusual business of vermicomposting; Jasu Shilpi because she was India’s only woman sculptor and Dr. Shikha Sharma (Nutrihealth Systems) because I have seen her a lot on television.Rashmi’s writing style is casual and easy-to-read. She has retained the conversational aspect in a lot of places providing translations in English where the phrases are in Hindi. She has conducted detailed interviews with each of the women considering the fact that each woman’s narrative runs into 10-12 pages. Reading through these, one gets a fair idea of the business and what it entails. In almost all the narratives, Rashmi has also mentioned the latest financials – sales turnover and/or profit figures whichever are available. This helps to get an idea of the size of the venture.I urge everybody, especially every woman, to go and read this book. It is an eye-opener in terms of the challenges that women are willing to accept and forge ahead; taking their families together with them in this journey. It also gives insights into the areas which women are willing to explore and make their mark in.The surprise at the end of the book is the fact that Rashmi has provided the e-mail addresses of all the 25 women in case one wishes to get in touch with them for help/advice. She has also provided a list of useful entrepreneurial courses available at various institutes and organizations willing to offer flexi-time careers to women.Pick up this book and you will not regret it. It will open up your mind like never before to the immense power of a woman. And in this nation of ours where we worship female goddesses such as Lakshmi, Durga, Saraswati, Kali, Devaki, etc. it makes immense sense. Respect a woman, support her in her endeavours and see the magic she creates – that is the central theme of this book. And every man and woman should remember this. Reading Rashmi Bansal’s book will ensure we do just that.I am going with 5/5 for this book.Disclaimer: This review first appeared on my blog www.pallosworld.blogspot.in. Follow Every Rainbow is the book on stories of some India's amazing women entrepreneurs.Each story inspires not by their monetary success but by their extraordinary efforts and passion to achieve dreams. With taking care of family needs, these women make her own identity out of the walls of her own kitchen which is truly spectacular. The mountaineer at the age of 50 climbs Mt. Everest, the sculptor who makes huge bronze sculptors by herself, a girl who starts her business of bags and turns it to big brand 'Baggit' , a lady who jumps into pharma business to save her family business and just excels into it, a woman who just starts her own women boutique and it becomes 'Biba'.. They all have shown that there are no limits in any fields by being a woman and say 'Follow every rainbow' in their actions..
..the book shares stories of 25 first-generation Female entrepreneurs..inspiring stories about their survival..All of Rashmi Bansal's books are a based on life of entrepreneurs, this one being special since it not only talks about entrepreneurs who worked with their families, but also those who fought against odds to survive and those who left a high-flying career to make a name..Amongst other things that you learn from the book, 'perseverance' is definitely my important learning..Overall, a pleasant read.. I think every woman has her own inner-self. Even when she strives to maintain her family balance, she is strong enough to follow her dreams and through them serve not only to her family but to the whole society.A must read for every ambitious lady. Inspiring! Totally in love with this book, have been recommending it to all my friends! It is just so inspiring ! To get to know about the lives of these ordinary women, who by their efforts and dedication created an extraordinary life for themselves. The book is about women entrepreneurs who have succeeded or are in the process of succeeding in their ventures. The book is in three parts; the first part is about women from wealthy families who have grown their own ventures without financial help from their family; the second part is about women who have succeeded in the face of adversity; and the third are the ones who have succeeded, thanks to their education.The books has a strong smell of feminism. Many of the entrepreneurs in the book. In many places it appears that the women are enjoying the revenge of bettering the menfolk for having suppressed by them for thus long in the human history. Unlike the opinion of W. E. B. Dubois who says that the Africans should learn to live equally, not by exacting revenge, with the white folk, the women seem to indicate that women must exact revenge.Having said that there are some very insightful statements. Here are couple that I liked.A good life is like a good meal - don't put too much on your plate. Only as much as you can eat, and what you enjoy.Corporate life is 20% really work you enjoy and 80% is reporting bureaucracy and politics.There are were also many that smells of antagonist feminism. Here are some that I absolutely disliked.1. In my view women can make better entrepreneur than men because women have more patience and they have more ability to multitask.2. I think perseverance and patience are two things that all women are naturally born with. One common theme that runs across is that the entrepreneurs succeed if they have support from their family, not just the parents, and husbands but also from in-laws. This should hold good for the men too and that is why the adage "Behind every successful man is a woman" (Limited to wives or mothers). In a similar way will we say "Behind every successful woman there is a man". At least after reading the amount of support the husbands extended to the successful women? Good but not great.The stories were not that interesting leaving a bunch of them.The research was not thorough and the book repeated the same thing over and over again.Yes it was meant for women entrepreneurs but the advice sometime was just not right.And for most of the time it seemed the stories repeated the same format-Women faced problem..she started business...family supported or didn't...divorce in cases...business stuff (that was what the focus should have been on)...more family stuff...children...end.This needed more material...not just sories. Sometimes in life you need a kick, to make yourself believe that you can do anything. Nothing can stop you, you just have to trust yourself, that's what this book teaches you! !An inspiring book, with 25 remarkable journeys of women who made their destiny not by luck, but by hardworking and having faith in their own self. A must read for every woman, who wants to make a difference in any way to her life!! Pick it up and read it!! It's worth reading!! This books truly inspires you to make something out of your valued life and how a simple idea can make wonders. The insatiable spirit of women entrepreneurs who believed in their ideas and had guts to follow them despite of the hardships is commendable. The author has itched together the stories of such awe inspiring women very beautifully. This book contains the stories of 25 successful women entrepreneurs. I just loved reading each story and there were some I like to go through again and again. Below is my review on this book:http://sanchitasarkar.wordpress.com/2...Let me know your inputs on this review. One feels buoyant after reading this. I have loved this author's work right from day one! this is an important read...especially for women.It has true life stories of women who have balanced their family and career life. This is a truly inspiring book. Quiet an inspirational stories of 25 women in the professional journey. I have read few books with the similar background. Easy and quick read. Only difference I found is that the author gave few resources and links to reach people who are featured in the book. Rashmi Bansal - Rashmi Bansal is a writer, entrepreneur and youth expert.She is the author of two bestselling books on entrepreneurship. ‘Stay Hungry Stay Foolish’ features the stories of 25 MBAs who left lucrative jobs to follow the rough road of entrepreneurship. The book created a new record in Indian publishing by selling over 300,000 copies and has been translated into 8 languages. Rashmi’s second book, ‘Connect the Dots’ focuses on non-MBA entrepreneurs. It has also been a bestseller, selling over 100,000 copies.Her third book ‘I Have a Dream’, on social entrepreneurs, is releasing in May 2011.Rashmi is co-founder and editor of JAM (Just Another Magazine), India’s leading youth magazine. She writes extensively on youth, careers and entrepreneurship on her popular blog: Youth Curry.Rashmi is a columnist on popular Indian news portal Rediff. She has been Consulting Editor with Businessworld magazine and Bloomberg UTV, where she hosted India’s first interactive show on careers.Rashmi is a consultant for international youth research agencies such as The Futures Company (a division of WPP, London ) and Flamingo Research (Singapore ).A guest lecturer at various business schools of repute including IIM Ahmedabad, IIM Bangalore, ISB, S P Jain among others, Rashmi mentors numerous students and young entrepreneurs. She also conducts motivational talks and youth insight seminars for corporates.